Most plasmids used in the transformation of filamentous fungi depend for their maintenance on integration into the chromosome (Ballance 1991). Previous attempts to isolate plasmids capable of autonomous replication were unsuccessful. However, Johnstone (1985) had used a gene bank consisting of genomic inserts in the argB + plasmid pILJ16 (Figure 1) primarily to clone developmental genes, and reasoned that some members of this gene bank might contain inserts able to promote autonomous replication. Such a plasmid might replicate or be partitioned less efficiently than the chromosome and would therefore be identifiable by the instability of its transformants. On this basis three unstable transformants were selected and from one of these a plasmid was recovered which retransformed argB strains much more efficiently than the original vector. 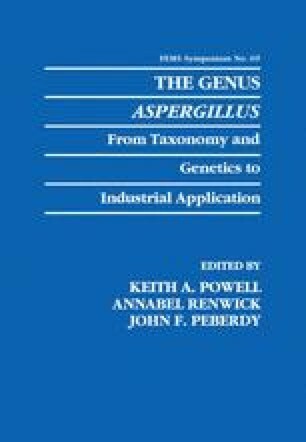 The properties of the Aspergillus replicating plasmid (ARp1) have been described by Gems et al (1991) and are summarised here.